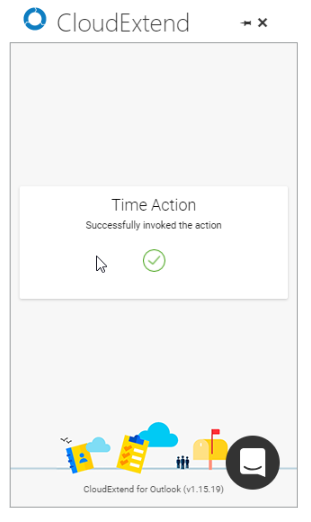 CloudExtend Outlook for NetSuite Enterprise Edition customers can take advantage of Actionable Messaging to allow supervisors to approve timesheet entries directly from their Outlook mail inbox. Microsoft has not yet made the Actionable Messaging API available for desktop Outlook on Mac. If you are a Mac user and wish to use Actionable messaging connect to your email via your browser. CloudExtend bundle installed in NetSuite Account. CloudExtend Outlook Add-in installed on Outlook accounts of users who will be approving actionable messages. 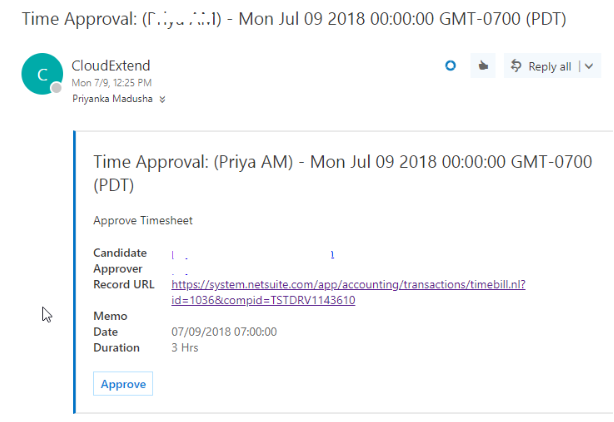 As a supervisor, if any of your team members create a new Timesheet entry or expense entry you will get an email from CloudExtend (actionable-messaging@celigo.com) as shown below. Click on Approve button in the mail and it will open CloudExtend Add-in and wait for the success message.